Death Knight tanks are two-pronged, it’s either you love them or hate them. Admit it, there are a couple of heroic dungeon PUGs where the DK tank kinda screws up the pull, can’t maintain a decent aggro, or worse, confused whether they’re really tanks or a 4th DPS. Players usually have a hard time choosing on which talent tree they should focus on when it comes to tanking. Unholy, Frost, and Blood specs have abilities that are extremely useful for tanks, but they couldn’t learn it because they need to spend talent points before getting them. Originally, Death Knights are Blizzard’s experiment in concocting a hybrid class that can play 2 roles, whatever talent spec the player chooses. This experiment received mixed reviews as DKs tend to get envious of their Pally, Warrior, and even Druid counter parts’ dedicated tanking tree. But fear no more, you harbingers or pain for ranged DPS (hunters hate your Deathgrip). Blizzard learned its lesson and now gives the Death Knight tanks something to look forward to in Cataclysm. There will be Blood as DKs have the Blood talent tree as a dedicated tanking tree. 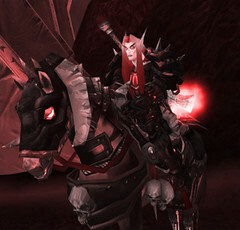 During the time of Wrath of the Lich King (today), Blood, Frost, and Unholy share tank-useful skills and bonuses. These are now being transferred, such as Unholy’s Boneshield, to the Blood talent tree for maximum DK tanking experience. Having Blood as a pure tanking talent tree makes sense because it has several abilities that allow the Death Knight to absorb massive health from opponents while attacking. These life-draining attacks make the DK tank a hard nut to crack, especially in raids. Damage Reduction: Pretty self explanatory. No information yet though on how much damage reduction will a Blood DK receive. Vengeance: A new mechanic designed to ensure that tank damage output doesn’t fall far off behind as damage dealers improve their gear during Cataclysm. Whenever the tank gets hit, Vengeance will grant a stacking Attack Power buff equal to 5% of the damage done, up to a maximum of 10% of the toon’s unbuffed health. This ability definitely adds another dimension of damage dealing or damage recount. It’ll certainly give the DPSers a run for their damage count to prove that they are needed. A little unfair, but hey, DPSers get more health now from gears, remember? I guess it’s Blizzard’s way of balancing things out. Healing Absorption: Again, self explanatory, but further details have yet to be released. A skill that can definitely add more damage being dealt and threat generated by the DK tank. Necrotic Strike (level 83): Necrotic Strike is a new attack that deals weapon damage and applies a debuff that absorbs an amount of healing based on the damage done. In my opinion, the Death Knight tank’s best ability out of the 3 new ones. This toughens up the DK even further as another damage done=health restored ability joins the fray. Dark Simulacrum (level 85): The death knight strikes a target, applying a debuff that allows the death knight to copy the opponent’s next spell cast and unleash it. A similar skill to Spell Reflection but does not cancel the incoming spell. Even though it’s not that great, it certainly is fun to play with during an encounter. Stat changes in World of Warcraft: Cataclysm also affects the Death Knight tanks as certain stats are removed or modified to make things simpler. Parry and Block Rating and Stamina will be one of the tanks main concerns as the expansion hits the shelves. The rune system will also be modified as it will change how runes will be regenerated and stored so that the Death Knight won’t have to worry about wasting runes during battles. Essentially, you have three sets of runes filling every 10 seconds instead of six individual runes filling every 10 seconds. (Haste will cause runes to fill faster.) Another way to think of this is having three runes that go up to 200% each (allowing extra “storage”), rather than six runes that go up to 100% each. Our much loved (and also much hated) Death Knight tanks have a lot of store in them as Cataclysm presents the Blood as a dedicated tanking talent tree. Gone will be the days where DKs get confused if they’re tanking of DPSing. It will be a glorious moment for these undead ex-agents of the Lich King. Let’s just hope these boys can keep up with the other tanks that are getting some polishing as well.